Industrial Magnetics acquires Clamp Mfg. Co.
Industrial Magnetics Inc. acquired Clamp Mfg. Co. Since its inception in 1973, Clamp Mfg. has been a family-owned business. A range of industries have come to appreciate the reliability of its Kant-Twist clamp and No-Mar hammer product lines in thousands of metalworking, welding, assembly and general manufacturing applications. 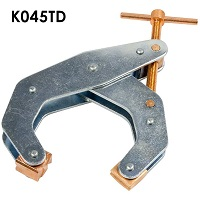 Kant-Twist is a multi-purpose clamp, combining the best features of ordinary “C” and parallel clamps with free-floating jaws that adjust to un-parallel surfaces. The unique design will not “walk off-center” when pressure is applied against the jaw.